We're so glad to see so many of you lovely people here tonight, and we would especially like to welcome all the representatives of the California Highway Patrol, who are waiting for me and the Society after the show. We sincerely hope that you all will enjoy the show, and please remember people, that no matter who you are, and what you do to live, thrive and survive, there are things that make all of us the same. You, me, us, them, everybody people, everybody. I know I've mentioned the virtues of Your Local Store of Ethnicity (LSE). Are you getting out there? Are you stopping in to see what tins they have? Today I returned to the Nordic House. I had already purchased these tins on my last visit, but needed some accoutrements and advice; as it turned out I was in the right place. May-Brit, who might or might not have believed my Sardine and Bull story was extremely helpful. I told her my Norwegian intentions and she filled my plate. 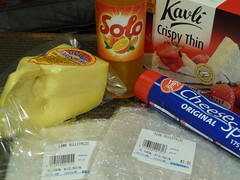 Jarlsberg cheese and Kavli Crispybread were her first suggestions. Next, she sliced me off some local Pork Rullepølse and Lamb Rullepølse, which she assured me was enjoyed in variation all over the Scandinavian Continent. She pointed out a tube of Kavli Cheese Spread and I couldn't resist (not the one with shrimp), after all May-Brit is Norwegian. Some baguette and baby greens and it's on. I asked her about beverages of course. She sold me a Solo orange drink I thought the Wife might like. She didn't think there was any Norwegian beers around these parts. Fortunately there was one other customer in the store and He suggested Whole Paycheck. As much as I hate to admit it Whole Foods does have a great selection of beer and a fine tin selection. Sure enough, they now have craft beers from Norway, Sweden, and Denmark. When I enjoyed the Sunnmøre tin, and the Gaffelbidder (both procured from the Nordic House) none were to be found. 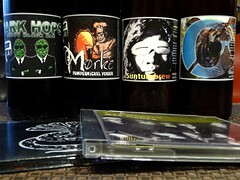 I got a Beer Here Dark Hops hoppy black ale, Beer Here Mørke pumpernickel porter, Nøgne Ø Sunturnbrew smoked barley wine, and a Nøgne Ø Tiger Tripel abbey tripel. These are all imported by and probably package designed by Shelton Brothers. I'm not going to turn this into a beer posting, it's already a shopping posting, You can read about these beers everywhere else, but I am going to start with some Turbonegro and the barley wine just to kick things off. 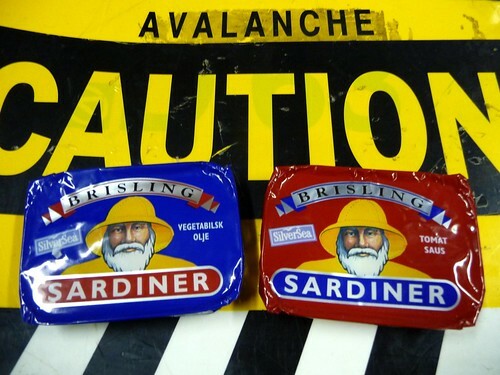 SilverSea Brisling Sardiner. One in Vegetablsk Olje (soybean), and one in Tomat Saus. According to a label obviously stuck on the back during U.S. import, these are a North Atlantic product of Scotland packaged for Norway. The aftermarket label is titled "Norden" which is Scandinavian for Nordic apparently. No direct website or info out there so we're on our own. It does look like these are refered to as the Blue and the Red. Like, "Gimme a tin of Blue", nice. This reminds me of a Local up in Portland that A23 told me of. Where they keep the tins chilled in the fridge and when you stop in to get one for lunch they offer to pop it for you. Maybe someday we'll get more info/pics on that. Another packaging note is the Blue tin is "Best før utgangen av 2008" and the Red tin "Best før utgangen av 2009". These are Brisling, so 8 to 10 tiny tots, smoked, skin and bones. Let's start with the Blue. These are pretty fatty and rich for such a small wonder. I wonder how the aging effects a tin. They start out smokey and finish with a bit of sweetness, but they kind of disolve away too quickly. Hell, on to the Red. A bit firmer with a mild red sauce. The Sunnmøre is better. These are both Average. Three out of Five Tins Twice. These would make an Amazing Sardicado Sandwich. But let me tell you, the meats were Killer (the lamb dominated), the cheese really good and the cheese in a tube - is like crack. Sooo good. It's only got gouda, water, and disodium phosphate in there, and they keep it refrigerated at Nordic House. It is perishable. A smear of tube cheese, a leaf or two of lettuce and a sardine on that crispybread is unparalleled. 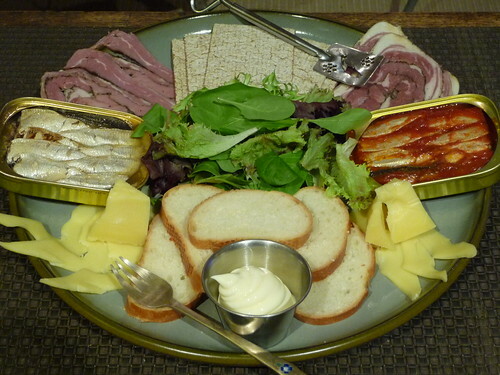 This Nordic Antipasta Platter Works. Yeah, that's a lot. Skip that and listen to Norway's Greatest Export. If that's too much, well, at least stop in your LSE and see what They have. You had me at Sardicado Sandwich. I will likely say the same thing in the next post. Seriously? Sardicado Sandwich? I say fie on those writes for Good Eats who didn't come up with it first. It's brilliant and delicious and amazing. Well, scottish sardines sold under a norwayan brand… shall I repeat they are herrings and not sardines !. That's why you can't find them in Europe… And here in France nobody knows what brislings are ! But I'd like to taste. They may be as good as the tin of "à la créole" sardine filets in pineaple sauce with grapes I tasted last evening … I've got to go to Norway and have a few words with Piers ! I was dying to know where the intro quip came from. I'm going to say its 60's: Stones in Gimme Shelter? Nah, it was from the Blues Bros. movie as the intro to Everybody Needs Somebody To Love. Having just discovered it, I've got to drop a line letting you know how much joy the mere existence of this blog brings me. Thank you, sardine society. Though I suspect my palate lacks the sophistication and discernment of your connoisseurs, I am a proud member of the august body of worldwide sardine lovers.